Kdrama Goblin : The Great and Lonely God has just concluded last week. Goblin has officially landed as my most favourite Kdrama of all time, I'm still having a hard time to get over it. It does have flaws here and there but the overall story satisfied me. If you're wondering, Iris (2007) was my most favourite Kdrama before Goblin took over. So here's what I like about this drama. I was anticipating this drama way before they released their teasers, I was hyped the moment I found out that Lee Dong Wook was going to be in it as he is my most favourite K-actor, after Kim Soo Hyun. Gong Yoo as the lead really set my expectation high since his 'Train to Busan' was so awesome and he did a great job in Goblin, almost stole my heart from Lee Dong Wook teehee. I love the female leads especially Yoo In Na, she's my favourite K-actress. The antagonist character, Park Joong Won, played by actor Kim Byung Chul also did a very great job as I hated him with all my guts. It is a fantasy story about a Goblin, Kim Shin, being punished by the deity because he killed thousands by being immortal and only his bride can pull out the sword in his chest for him to finally return to ashes and die. Along his search of his bride, he met an amnesiac Grim Reaper and somehow they ended up living together. 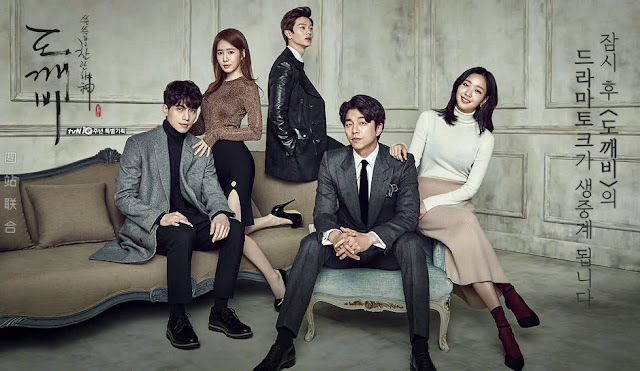 Things got complicated when Goblin finally meet his bride, Ji Eun Tak, their tragic destiny and the true identity of Grim Reaper and Ji Eun Tak's boss. I really really love the plot as it was new and fresh, unlike typical drama where two heroes falling in love in one girl. The mystery was revealed one by one perfectly as I had goosebumps every time it unfolded. Though there are scenes that I found are disappointing such as it was too easy for Ji Eun Tak remembered Kim Shin. But overall, I love this drama! I really love the mystery about the relationship between Kim Shin-Grim Reaper-Sunny and the love between the lead actors but my favourite relationship is the bromance between Grim Reaper and Goblin, with additional help from Deok Hwa. These three really steals the scene, I never get enough of them each episode. I mean come on, handsome men and funny scenes, whom girls wouldn't like it? I love all the OST in this drama especially 'Round and Round' and 'Stay With Me'. Though there's controversy around 'Round and Round' as fans were attached to the intro singer, Han Soo Ji, I was too actually, but the full version with Heize's voice wasn't that bad, seriously. I love how perfect her voice blends with the melody of the song. Also, I really love Punch's voice in 'Stay With Me'. Hit the link below to listen to the song on Youtube, especially if you're a Kpoper. If you're a fan of K-drama and you're hype for fantasy genre, Goblin should be in your must watch list. I still can't believe the drama is over, the syndrome doesn't seem ending that soon. I'll miss Goblin so much. So there goes my most favourite K-drama so far. What's yours? I'm so excited to talk about Goblin. The guys bromance are so heaven! Feels like watching more and more. Hope there would be more dramas like this one. Thumbs up!